The punchlines keep rolling in. 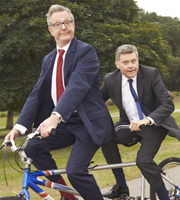 Those indefatigable kings of comedy, sorcerers of satire and masters of mockery, Jonathan Biggins and Drew Forsythe are back in the saddle and gearing up for another glorious year of political satire – the stage will be bigger and so will the laughs. We like to think of it as continuity with change. This performance contains haze throughout and two uses of strobe lighting. Patrons with hearing impairments can access The Wharf Revue through captioning on Saturday 15 September at 2pm. Riverside is able to offer this through its association with and Go Theatrical! TM. Visual text or captioning is available via large screens inside the theatre as well as smart phones and tablet apps. Download the App Go Theatrical App at theatrecaptioning.com.au or at the Apple App Store. The punchlines keep rolling in and political satire has never been so good!